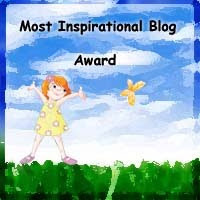 Andrea, at Arise 2 Write has given this award to her readers. Now I have told you a little about dear Andrea before and how much of her blogging is dedicated to spreading the prayer needs of those in real life and in blog world. 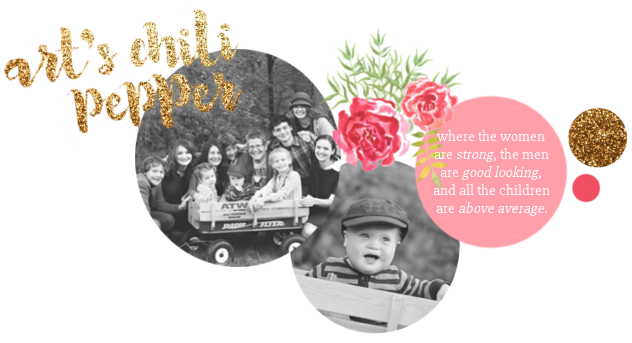 In my new tradition of sharing one of my favorite posts when giving an award, I would like to draw your attention to this beautifully written tribute to Andrea's beloved baby sister, who died young and tragically. It encompasses so much more, though. As she challenges us all to examine our relationships with our own siblings. But don't stop there. Improve them if needed or make sure we have shared with our loved ones our feelings for them. Stop by and see Andrea. And heed her advice. As a woman coming from a lifetime of broken family relationships, I assure you that you don't want to wait one more minute. I would like to pass this on to the bloggers I have found more recently who bring me inspiration each time I visit their blogs. Debby at Heavenly Humor it is tough to find one post that I like best because all the ones I've read drive the point home with a refreshing sense of humor. Even dear husband laughed out loud when I read him the post Sharing God. Joshua at the Book of Joshua pick one they are all inspiring. 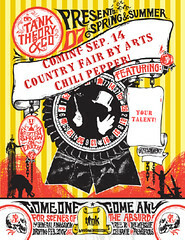 And don't forget to click on the button below to read all about the country fair coming to Art's Chili Pepper on September 14th! Thank you for your sweet words. You always encourage me to keep writing from my heart. I pray my words about Dayna will touch the lives of all who visit. Great Post about Andrea! It was heart felt and very touching hearing about her sister. Oh, and thank you for that great comment on my post about your dear hubby and I being buddies. Who knows, maybe somewhere, sometime God willing we will meet. I have almost been thinking of an idea. A Blogger Vacation House Swap! We each think about places we would like to see around the country and see if it is feasible to just trade homes for a week or even a weekend. Well, it is just a thought anyway. Kat - Thank you so much for this award that honors and recoginizes not only the life of my grandmother, but how her death has been used by God to impact and touch the lives of so many people. I will post about this very soon. P.S. That house swap thing...just might be an awesome idea! Hey Kat, I left a couple of comments for you over on my blog page, but i thought i would hop back over here and leave it on yours. I have been reading about Dyslexia since you mentioned it, I just felt I should. I am astounded! My son has 90% of the signs and symptoms used in diagnosing Dyslexia! I think this is the perfect way to share this award is not only to pass it along to someone who is inspirational to you but link that post that spoke to you personally. Congratulations on receiving and being honored with this award! Almost everything you have written and will continue to write inspires and motivates us all. You are an inspiration to me. This is a good award for you. I have another award for you which you have probably already received, but I still want you to receive it from me. What a great award. Congrats! So true you are inspirational. I really like Andrea's blog as well and I just began visiting Heavenly Humor and I enjoy myself there also! Now I'm gonna check out the other blogs you passed the award on to. Just got back from vacation, saw your post on my blog to stop in here. You sweet, sweet thing! How thoughtful of you to be thinking of others, and to be such an encouragement. I have a mountain of unpacking and laundry to do, but I plan on coming back soon and getting to know you better.